About Camp Leo Council of S.C. Inc.
Camp Leo provides a unique experience for the sight-impaired children of South Carolina. All campers are legally blind, although most have some sight. Most of the campers’ families are of modest means and would be unable to afford camp for their children even if a "for pay" camp was available. Camp Leo provides impaired children the opportunity to enjoy camp activities with new and different experiences, in the company of other impaired children under the supervision of caring adults. The Camp Leo Council hires a full time staff, including two Directors and 20 to 25 counselors, depending upon the number of campers. The camp is also fortunate to have many Lions Club members and other volunteers from the community to help with specific camp activities. 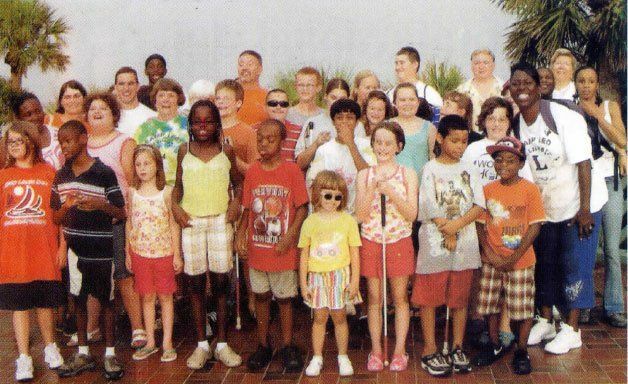 Camp Leo was founded in 1975 by the Hilton Head Lions Club in partnership with the South Carolina Commission for the Blind. Unfortunately, the Commission lost its federal grant in 1981, leaving the Lions with the responsibility for the financial support of the Camp. The Commission has continued to provide important services such as contacting potential campers, sending applications and screening applicants. For information on locations and addresses, visit the SC Commission for the Blind. During the early years of Camp Leo, the Presbyterian campground located on South Forest Beach was used. That facility was closed in the mid-eighties, and the camp was moved to the Hilton Head Preparatory School. It spent a brief period of time at Hilton Head High School, and now resides at St. Andrews by the Sea campus. The church is converted to a camp by placing bunks in some classrooms, having camp activities in other classrooms, and turning the cafeteria into the gymnasium and food services area. Activities include beach walks and games; swimming; fishing; boating; scuba diving; kayaking; movies; athletic games; and evening activities with DJs, music, and talent shows.